It can strike at any moment without warning and before you know it all your pre-determined strategies and mental preparedness gets chucked to the curb in a crumbled mass of uncontrolled shaking and larbored breaths. The effects of buck fever doesnt necessarily restrict itself to the visual confirmation of a buck. Some hunters feel the same exact rush of emotions when dropping a sight on any deer. The reaction takes on many forms for different hunters which can be excellerated by a large set of antlers, close proximity to your game animal, lack of experience, and an absence of confidence. For some the rush experienced is mild in temperment and is exactly the reason why they hunt. For others it seems more of a curse as they watch yet another missed opportunity at filling their tags. Fortunately, there are some basic steps and excersizes that can be utilized to help supress the effects of buck fever. I have categorized 3 seperate levels of this occurence with a level 3 being the worst case of buck fever. 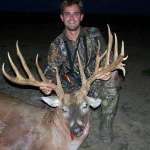 The first and foremost note I would mention here is the fact that you are seeing deer and these deer apparently fall into the class of animal that you would wish to harvest. That alone should lend some confidence that you have done your homework in the scouting arena and have set yourself up to add your tag to at least one of these animals. You’re in the right place, at the right time, and have not been detected. Well done! You now have that first critical edge over a game animal that spends nearly every waking minute of it’s time trying to avoid this very same scenario. Think of this as a major accomplishment for yourself. For some hunters the effects of buck fever starts well in advance of the actual visual confirmation that a deer is approaching. Audible sounds, such as the crunching of leaves or a twig snapping, will grab your attention like a pair of high heels across a hardwood floor in a silent room. That is, of course, in reference to the majority population of heterosexual males that are not hearing impaired. Regardless, sound created by a deer in the forest would be typically scored on the minimal scale and for this reason it envokes a magnitude of thoughts which include a heightened sense of excitement and peaking of curiousity. You believe you hear the deer approaching and how you handle this flow of emotions from the onset can determine the outlook of your hunt. Our first reaction is to try and look in the direction of the sound. Most times this will be where the inexperienced hunter makes his or her first mistake by relinquishing the fact that they are absolutely sure that the approaching animal is a deer. And to compile the matter it simply has to be a big buck. Futher, it is assumed that the deer will be standing in a specific area that the hunter knows intimately from their many travels to and from their hunting location. The fact is that in all likelihood the deer will not be where you expected, if it is a deer at all, and the given ratios will prove that it is more than likely a doe. Expectations are fine, in fact they’re perfectly fine. Hunters spend countless hours daydreaming of that big buck and playing out that whole scenario in their mind. This is mental preperation for the hunt and a good excersize to create the mindset needed for capitalizing on the moment of reality. But, when you are the person dealing with a history of buck fever, your best option is to hold tight and refrain from any movement such as sneaking a peak at an approaching deer especially when that animal will not be presenting a clear or comfortable shot. This natural reaction in everyday life tends to compound your problem during a hunting situation simply because you need to minimize the timeframe where buck fever can occur. Your heart is already beginning to beat fast. The actual sight of an approaching buck will not suppress the already growing anticipation. Focus on your shooting lanes and the mental aspect of what may take place and let the deer take it’s natural course. I know. That sounds easy enough sitting behind a desk typing out an article but trust me on this one. I’ve been down this road more than a couple of times. If you’re fever starts out at the mere sound of a branch cracking then this is where to address the problem before moving further along. Some people will tell you to think of something else. I would tell you, as I have earlier, to stay focused on the hunt but just change that focus. Can you go to that Happy Place? Whatever. That happy place for me happens to be in a tree with a bow or sitting on a stump in the swamp with a shotgun during hunting season. Top that off with the rustling of leaves to my side and that happy place just took an upward swing towards a happier place. I’ve heard mention that some hunters will close their eyes to try and deal with buck fever. Close my eyes? If that works for you then great but just the same I’d rather have both eyes open for the fact that just because you dont hear a deer does not mean he isnt standing right below you. On that note it may be more suitable for this type of hunter to actually restrict the noises through suppression of some sort. Earplugs would work fine and I’m sure there are a lot of hunters out there with the IPOD listening to music. If thats what it takes for you to become more efficient in beating this level of buck fever then try it. Personally I like to hear what is going on around me. Some hunters can get along respectably when it comes to an approaching deer. Many times the distant noise is passed off for a squirrel or, as in true form, thought of in a manner of reality. The hunter simply understands that they cannot shoot something they cannot see and until the animal exposes itself, no need to lose their cool. In essence, this train of thought is where our first class of hunters are striving to graduate into this next level. But in this level we have a hunter who can handle everything up to this point. That is, until, a deer walks out and the hunter realizes this is it. This is the opportunity they have waited for and it’s standing right in front of them in full living color. This form of buck fever can often result in your arrow falling of the rest. The inability to draw your bow. The feeling that your bows letoff is failing you in the time of need. Your heart has become a deafening pounding in your own ears and has affected your ability to steady your bow once you have managed to draw your arrow. This isnt the time to trigger your release and hope for the best. It’s time to re-evaluate what has taken place. I categorize this behavior in level 2 because as mentioned earlier this hunter has enough control to progress to this point. From a distance the sight of the deer stirs the thought of hope and planning. In close proximity the hunter elludes to the fact that the hope will now be of that in which he can successfully draw his bow. In my opinion this case is created from a lack of actually being close to deer in their natural habitat. Case in point: An ex-hunting-partner of mine handled the approaching deer and any sounds attributed to that deer with relative ease. In fact, as we created video of her archery hunts, she often grinned or raised an eyebrow when a deer approached. When that same deer came within bow range she pretty much fell apart. You could see the change of expression on her face, hear her breathing begin to increase, and notice what appeared to be a very uncomfortable hunter. That could be attributed to excitement but, the action of her arrow falling of the rest 4 times in a row told the rest of the story. In close proximity of the deer she simply forgot about proper shooting form, movement, or any type of control. By the end of that days hunt I had watched a large doe drop right before my eyes due to an errant spine shot that paralyzed the deer. Although that doe ended up in the freezer it was apparent that we had some work ahead of us to try and appease the problem of buck fever, or in this case doe fever, before any further hunts could resume. Here was the strategy we used. We began sitting in the treestands with only myself carrying a bow mainly for the fact that we have a large resident black bear population which supported a large male who had shown agression in the past. We would sit like any normal hunt and she would become familiar with the understanding of being in close-quarters with the deer passing by. I knew this was not something she enjoyed. Within a week she began to once again bring her bow with her to the stand, minus any arrows. She would practice drawing her bow on deer as they sauntered past the stand. At the beginning of the third week it was evident that she could draw her bow undetected in a calm enough manner to warrant filling the quiver once again for another hunt. Two days later she dropped a 6 point buck with a perfect double-lung shot and ended her season. Consequently, the black bear mentioned earlier found the entrails irresistable which in turn changed my own hunting pattern for the remainder of the season. I don’t expect that this same technique will work for every hunter. In fact it involves spending a lot of time on a stand with the possibility of alerting the deer to your presence and possibly changing their patterns. The way I approached the problem was that I would rather address this situation now and not take the chance of wounding a deer in the future due to something that we obviously had the power to at least minimize. If you can take the time to aqquaint yourself with the prospect of being very close, as in such the case of the bowhunter, then you will probably find that you can alleviate a portion of the buck fever encountered in this level. I’ve heard advice from some hunters that they focus on a particular portion of the deer. Preferably where they had planned to place the arrow or bullet. Supposedly anything to distract yourself from the antlers works from some people. I have to lean towards that being more of an experience issue or maybe a Level 1 buck fever situation. Experience breeds confidence and as with anything else, the more familiar you become with most situations, the better you can handle or navigate the known problems. Confidence in itself has been said to be a great motivator but nothing, including reading these articles, can fill a void in experience. I have seen time and again where novice hunters repeatedly make the statement that they [b]will[/b] get their deer this season end up blowing the shot only to later say that they were really nervous when they pulled the trigger. Why is that? What does confidence or experience have to do with buck fever? Everyone, I mean everyone, experiences buck fever to a certain degree and at times different levels. I wouldnt expect a hunter to actually see, shoot, and retrieve, their deer without some type of elevated excitement. It is part of the reason why we choose to hunt but for many experienced hunters it becomes so familiar that it’s hard to recognize the satisfaction or enjoyment through lack of expression. These hunters exude confidence in their abilities from years of experience while a young hunter has only heard the tales of buck fever and it’s effects. His first round with the fever will probably take it’s course in relation as to whether or not he was able to capitalize on that very first situation which may only be revealed after the hunt. For some it would be considered excitement as they stand over their deer and talk about how their heart was pounding when the buck walked in or how shaky they were when they aimed and missed the deer completely. In either event buck fever can start at a very young age. About 28 years ago I tackled my first round of buck fever when I thought the hunt was over. I had a short 400 yard walk back to my fathers truck to meet him after the morning hunt. As I stepped on the dirt road I realized something didnt look right up about 100 yards or so. When it moved I realized it was a deer and in reflex I shouldered the rifle and scoped a young 4 point buck. This many years later I clearly remember speaking to myself saying, it’s a buck, it’s a buck, it’s a buck. I rested my gun on a branch for a steady shot and dropped the crosshairs on the bucks chest at 80 yards when he reached a small opening and squeezed off a round. The buck dropped and rose just as quickly and ran off over the ridge. I missed. Plain and simple missed him and he slipped on the muddy road where he stood when I shot. Shortly afterwards dad appeared and I told him the story. He said a little case of buck fever hey? He was right. I didnt realize it at the time but sure enough I can recall my heart nearly jumping out of my chest and thinking that I had this deer no problem. My mistake lending itself to inexperience and something I had never encountered and obviously didnt understand in the least sense of the word. The following year I took my first buck with the same gun at about the same distance while sitting in an old blind. The fever struck again that day but I had learned from the previous year about trying to stay as calm as possible by focusing mainly on the first task at hand of shooting the deer. The field dressing, bragging to friends, and pictures, would all come later.